Maison Douce: A fun-filled day!! 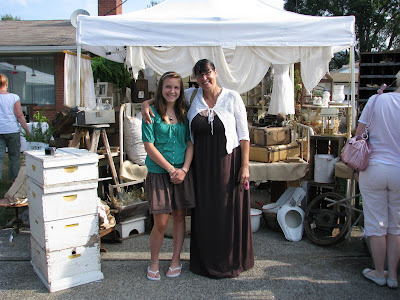 Yesterday my daughter Anna and I took off to visit the Kindred Roses flea market, hosted by our friends Julie and Christa in Julie's own back yard... It was nice to get out of the house after spending most of the week cooped up trying to avoid the heat wave... We had a wonderful time visiting and shopping and I was thrilled to spend some time with my teenager!!! 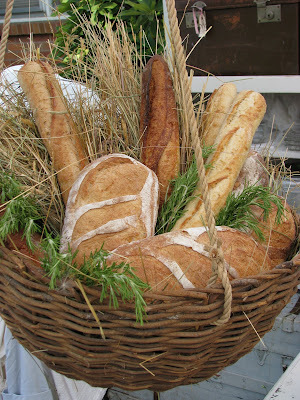 I absolutely looooove the bread vignettes created by Laurie and Debbie from Worthy Goods!!! I was so excited with what I found to bring home...!! 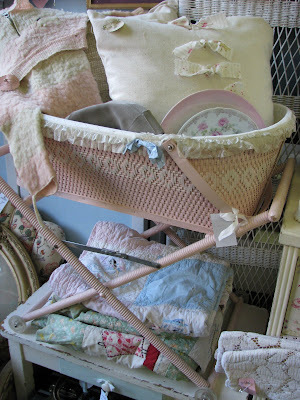 How cute is this bed, bedding included??!! Chippy and perfect! Other finds include an enamel pitcher (Jennifer, it was so nice to meet you! 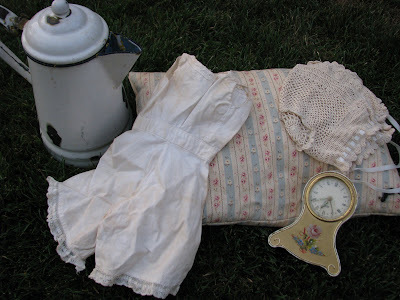 ), a ticking pillow, an old clock with hp rose, a darling baby outfit - Natalie, I bought this one for you! - and a crochet bonnet. 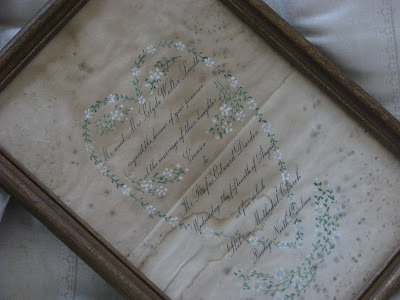 I was thrilled to find this vintage wedding invitation with a handpainted heart wreath... I wish it had the year... Eunice is marrying Mr. Rufus! Price: $5! Our afternoon was spent at some friends house who were hosting a gymnastics pool party!! Yes, I have to admit I have major pool envy!!! How gorgeous is this??!! How can you tell the pool is full of gymnasts? You will mostly see them upside down!! 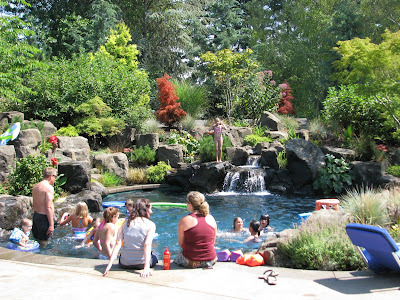 !How can kids spend five hours in a pool and have to be dragged out by worn out parents??!!! 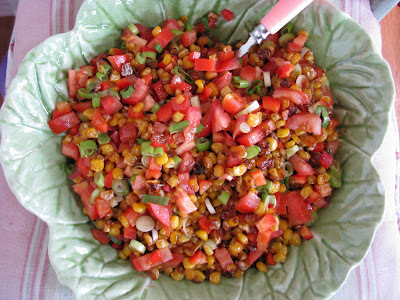 For the potluck, I brought a Roasted Corn Salad, a recipe I got from my neighbor Sarah. It is so delicious, I thought I would share the recipe with you! Combine corn and 1 tsp oil in a jellyroll pan coated with cooking spray. Bake at 425 F for 20 minutes or until browned, stirring occasionally. Combine 2 tsp oil, vinegar, mustard, salt and pepper in a medium bowl; add corn mixture, stirring well. Stir in tomato, bell pepper and green onions. Serve wam or at room temperature. My good neighbor Sarah makes this salad for all our gatherings. It is a recipe from Cooking Light, and I have always loved it... This was my first time making it, and I made (and will make) a few slight changes! First, I think next time I will broil the corn at 500 F for less that 10 minutes, it will still give the corn the roasted taste without drying it too much. Then, when it comes to the dressing, I prefer to use olive oil rather than vegetable oil, and I am sorry, but 2 teaspoons of oil just doesn't cut it for me (I'm European, what can I say??!!!). I used about 4 tablespoons!! Also, I didn't have white balsamic vinegar (I do love it, and I usually buy it at Trader Joes), so I used regular balsamic vinegar, and it tasted delicious. I hope you will try it, I am sure you will love it as much as I do!! It was so nice to see you yesterday and yes you found some great finds. That pool is awesome I want one at my house just like it. I could only dream. Oh la la wonderful finds!!! And your photographs are such yummy eye candy!!! Thanks for sharing your wonderful day! How lovely to spend the day with your daughter doing something that makes you both happy!! Pool envy is right....gorgeous. Your action shots of all the kids are really great!! I am flipping, flipping I tell you over that head board. That is fabulous. Thank-you so much for sharing that. Idon't even know where to start!!! Your finds... that POOL... wow! What a fun day! What a lovely day! The wedding invitation is so charming - I saw some 1930s birth announcement cards on another blog today, and the two would make a great set! 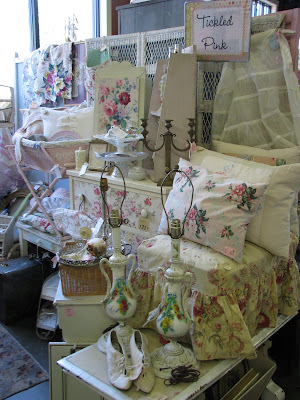 What wonderful finds, especially the headboard. There were many things in your pictures I would absolutely have loved. This is my first visit to your blog so thank you for sharing. 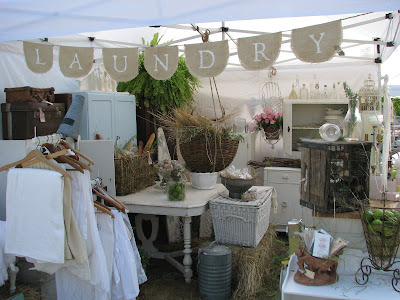 What a great little flea market you went to - I love everything in that lovely booth! You look so sweet with your daughter. Nothing like a little girl-to-girl bonding. You take fluffing to whole new level...your spot is just so pretty. What a wonderful day y'all had and that pool...oh mylanta! I love the headboard nee bulletin board and that is one of the best repurposing I've ever seen. Lucky lucky you and what a great price! It was great to see your smiling face and your beautiful daughter Anna yesterday! I am with you on the pool envy, wow! 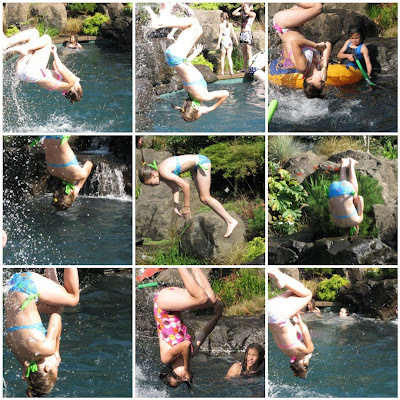 I love the pics of all the girls doing flips in the pool. Looks like a really great day with your girl. Can't wait to try the recipe. Thanks for sharing! Ah, my "secret" roasted corn salad REVEALED. I make it for neighborhood BBQs all the time. So amazingly beautiful...and merchandised so well. What a fun day you must have had. Your friends have such an eye and amazing talent. 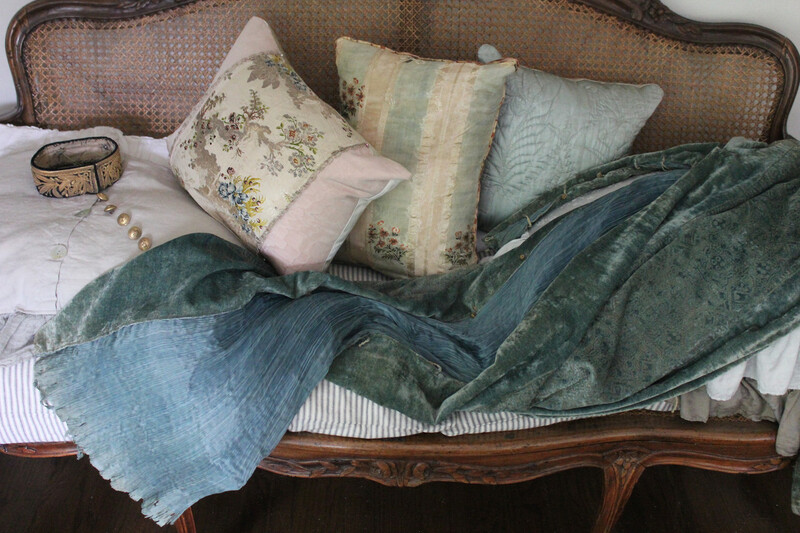 Love the ticking pillow you found and your booth is gorgeous! I want it all! Gorgeous photos again, you always leave me in envy! 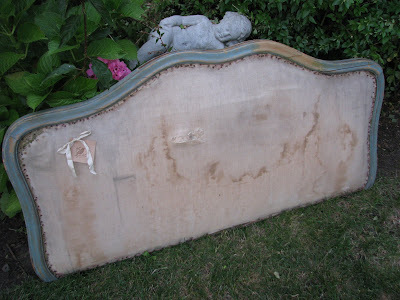 I love the heaboard turned message board, love it and that bed, perfect! Thanks for sharing isabel! So sorry to have missed you Saturday. We came a little late (chores and some stuff to return to IKEA ...) but was nice that you left some treasures for us! Love the beautiful little bed ... and that headboard .... yum! Can hardly wait to see what the footstool from the twins turns into. I just absolutely adore your blog and it was so wonderful to meet you in person. 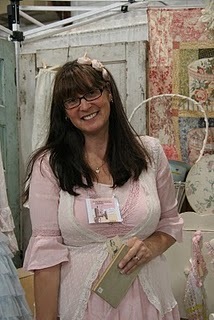 Thanks for taking the time to stop by my booth! Looks like a wonderful day! I love the message board and would have snapped that up in a heartbeat! Love your blog! 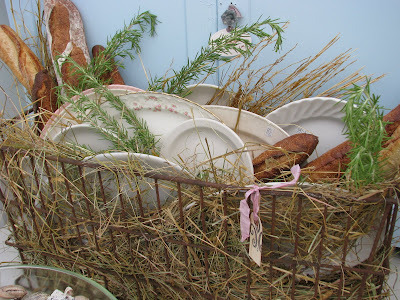 Love all the vintage eye candy on your blog. Always a pleasure to visit and dream of finding such lovlies in my neighborhood. Alas, we just don't get good junk here in Alaska!! Wish am living just a stone throw away. I really love the bed and the headboard. Dying for them. 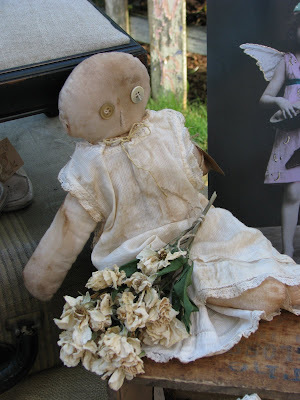 Cool that you been to fleamarket. We don't really have in Stockholm. 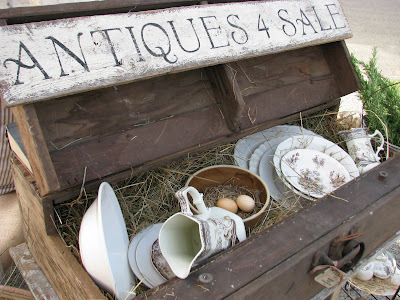 OMG -- this is MY kind of blog. i just discovered it and will be adding yours to my blogroll for sure! Love the sweet little bed and the message board is fantastic! $22! A great deal!! Oh my gosh, what lovely finds!!! 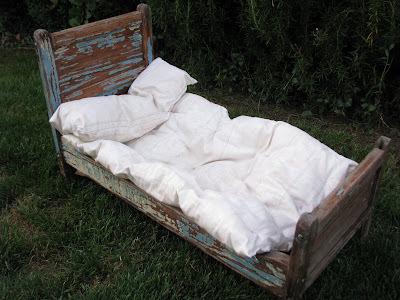 I love, love that old chippy bed. 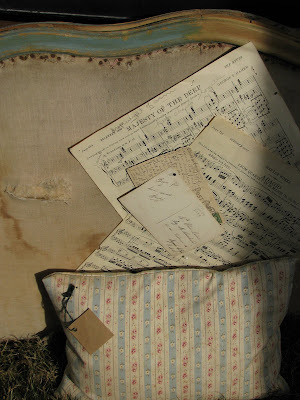 :0) And I collect vintage fabrics so I noticed that pillow ticking. What a fun time this had to be...I sure wish I had been in attendance! LOVE the baby bed! LOVE the headboard and LOVE the little baby outfit! Everything looks good! I was sad to miss the show. You took great pictures. I hope we can get together soon! Thank you sweet Isabel. It should be a great event.Lovely photographs! !